In Gluten Free Baking, unfortunately, it is not a matter of substituting any Gluten Free Flour and expect to get the same result as in wheat based baking. As you know Gluten is a protein found in wheat, rye, barley and triticale that, when water or liquid is added to it, makes an elastic dough. Gluten Free flours on their own do not have this elasticity and typically produce a much denser product, so blends of different types of grains are used to create gluten free flour mixes with a more versatile consistency that will work well in the same applications as wheat flour. Also when there’s no gluten in a recipe, it takes far more gluten-free ingredients to produce a tasty product. Wheat flour is typically enriched with vitamins and minerals, including iron, folic acid, and other B vitamins, and whole wheat flour supplies fiber. On the other hand, gluten-free flours do not provide the same nutrient profile. That is why, a gluten free blend would sometimes contain so many ingredients, like flax seeds, chia seeds, quinoa etc, in order to try include some protein and fibre. You can also find a wide range of ready mixed “All Purpose” Gluten Free flour blends that are designed to be an ‘easy to use’ replacement for wheat flour, the ingredients of which vary from brand to brand. 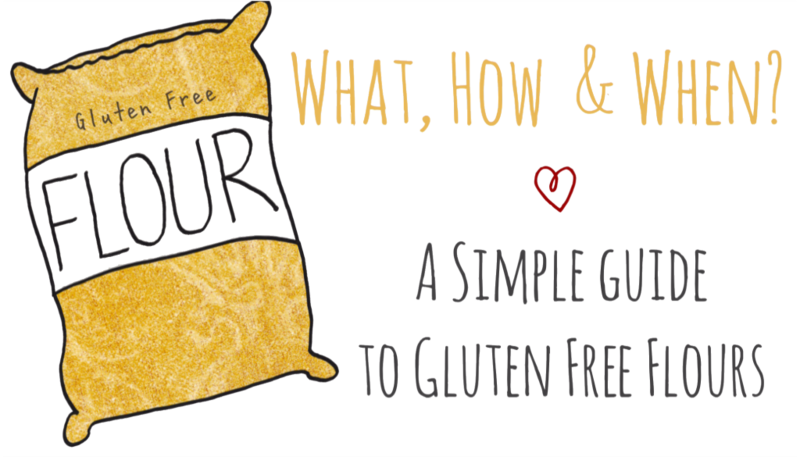 There are so many options that could be a foundation for a Gluten Free flour blend. Therefore, since the base ingredients for gluten free flour can be very different, different brands can produce very different results in baked goods, giving a recipe a completely different taste and texture. As a rule of thumb, a good flour blend uses a main or protein-laden flour such as brown rice or sorghum or beans, and then blended with a starchy flour such as potato starch, tapioca starch or cornstarch. The protein in the former lends structure and stability, while the starchy flours add lightness and airiness. Xantham Gum or Guar Gum are binders that are frequently added to gluten free flour mixes to give the flour some elasticity due to the absence of gluten. Flax Seeds, Chia Seeds and Psyllium Husk is now being used to do the same job, which also provide more fiber. Whilst shop bought mixes are convenient, I do tend to find that they lend a ‘gluten free’ smell and taste when I use them. I prefer to make my own homemade flour blend which produced many a successful recipe. It is best to prepare a large batch beforehand as it would be a time saver and would make gluten free baking so much easier! This is my favorite flour mix that works nicely for all-purpose use. The ingredients as you will note are easily available in many good supermarkets and the cost is quite low. I have used this blend in many recipes, in both sweet and savory dishes, with great success. You will be amazed at the amount of flours that could be used in Gluten free baking to replace wheat flour. Of course, most of these have to be used in conjunction and not on their own. Do not feel intimidated, you do not have to use all of these flours, but it is good to know something about them. The more you know, the less chance there is of a gluten free baking disaster! Many of these are not even available in stores and have to be purchased online. I will be elaborating more on those that are readily available and most of which I have tested myself. Almond flour or almond meal is very soft and has the same feel and appearance as traditional white flour. It is made from ground up raw almonds, to a fine powder. More, and it might end up as almond butter. This gluten free flour is perfect for quick flour recipe but not for rising dough recipes. It is high protein but not a cheap alternative. It is perfect in some recipes where it calls for small amounts of flour, eg. like the Little Sticky Toffee Puddings and Amaretto Lava Cakes where the end result will actually taste richer than with normal wheat flour! Amaranth is an ancient seed used widely in Mexico. It contains more protein, iron, magnesium and fiber than other gluten free grains. Amaranth has to be added in amounts of up to 25% of total flour in gf mixes. It cannot be used on its own as it absorbs a lot of water would make baked goods dense and heavy. But by adding amaranth to gluten-free flour blends in the right amounts, you can significantly improve the nutritional quality of your gluten-free diet. Arrowroot flour has the same consistency and texture as corn starch. Arrowroot is usually used a thickening agent and works well because of its pleasant flavor. Again, this flour is used in conjunction with other flours. Brown Rice flour is one of the most commonly used flours, It has a slightly nutty flavor and a very high nutritional value as it contains protein and fiber. White Rice Flour is easy to digest and blend, white rice flour has a bland taste. Relatively heavy and dense, rice flours work best in recipes when they are combined with other flours, especially those that are high in protein to balance texture and build structure. Too much rice flour (unless it’s super-fine grind) can produce a grainy taste and texture and can make baked goods crumbly. Chickpea flour is good for thickening up sauces and soups. It is also great to make bread have a “firmer” feel to it. Used more in savory dishes however it is sometimes used in muffin recipes as it gives moisture and also helps give rise to the baked product. Have you ever tried our Farinata Recipe with Chickpea Flour? Buckwheat flour is totally gluten free and has no ‘wheat’ in it as the name might imply. It is high in quality plant proteins, antioxidants, soluble fiber and minerals. It can be light milled or dark milled, the latter having bits of the hull thus lending it a more pronounced, earthy flavour. It is great combined with brown rice flour for a healthier bread mix and can be used on its own to make gf pancakes or the classical Italian pasta dish, Pizzocheri. Cashew Flour, like almond flour is very soft and has the same feel and appearance as traditional white flour. It is made from ground up raw cashews. It is perfect for quick flour recipe but not for rising dough recipes. This flour is made from brown rice flour and milled. Chia seeds is valuable ingredient in gf baking. These seeds are full of nutrition containing lots of Omega-3s, calcium, fiber, and protein. Chia flour can be used as a one to one replacement for wheat flour. Ground chia seeds on their own, mixed with a little water can be used as a binder to replace Xanthan Gum. Chestnut flour has a very strong flavor and dark color, comes either extra fine or stone ground. It is high in fiber but low in protein. Chestnut flour is used in traditional Italian baking, from pasta, such as gnocchi, to cakes, pancakes, breads and muffins. Since this flour is low in protein, it should be combined with a high-protein flour, such as bean, amaranth or soy flour, to ensure baked goods hold together. Coconut flour is mildly sweet and commonly used in quickbread recipes and some desserts. It is a low carb, high fiber flour, containing protein and saturated fat. It is suitable for many people who suffer from multiple allergies. It is added in amounts of up to 15% in a flour blend as too much could result in a very dense baked product. It can however be used as 100 % substitute to wheat flour, but the recipe would normally call for extra eggs to create height and airiness as in our Mega Doughnut Recipe. Corn meal can be either yellow, white or blue and is made by grinding up corn kernels. It has a nutty, slightly sweet taste. Corn meal can be coarse, medium ground or finely ground as in fumetto. Unless you suffer from corn allergies, cornmeal can be so versatile when it comes to gluten free cooking. You can make anything from corn tortillas and cornbread to wonderful polenta dishes! We have so many polenta dishes for you to try out! It also makes a great substitute for breadcrumbs. Made from a part of the corn kernel, corn starch is a flavorless white powder that lightens baked goods to make them more airy. It is highly refined and has little nutritional value. It is also perfect for thickening up soups, sauces and gravies. Can be used in place of arrowroot or potato starch. It’s an important part of many all-purpose gluten-free flour blends. We have also used cornflour to make Gluten Free Bread, a recipe adapted from Dan Lebotz. Check it out. Note : British and Maltese refer to cornstarch as ‘cornflour’. Flaxseeds are super high in Omega-3 fatty acids. They have a nutty flavor and work best in quickbread, and cake recipes. Like Chia Seeds, flaxseeds themselves are mixed with a little water making a slurry gummy solution which is used to replace Xanthan Gum in baked gluten free goods. While flaxseed is not as strong of a binder compared to xanthan or guar gum achieves, it does effectively reduce the probability of crumbly outcomes.You can make your own flaxmeal by grinding flaxseeds in a clean coffee grinder. Best to use golden flaxseeds rather than brown ones in baking as the brown usually give a greenish tinge to baked goods. The word glutinous describes this rice’s sticky nature. It does not contain gluten. It is traditionally used for rice confections that are very sticky in nature. It is used it in gluten-free baking to mimic the properties of gluten that are absent in our gluten-free flours. It comes from a variety of rice, similar to sushi rice that is different from the one used to make regular rice flours. Few recipes use sweet rice flour exclusively, but it is often used in conjunction with other flours because of its sticky properties, for example Sweet Coconut Rice Balls. Hazelnut meal, like almond flour is very soft and has the same feel and appearance as traditional white flour. It is made from ground up raw hazelnuts. Again, over grinding can turn it i to hazelnut butter. It is perfect for quick flour recipe but not for rising dough recipes. Very easy to digest, millet flour is mildly sweet, buttery, with a nut like flavor. Millet An ancient food, possibly the first cereal grain used for domestic purposes. High in protein and fiber and rich in nutrients, millet adds structure to gluten-free baked items. It is excellent for flat breads, breads, pizza and other items containing yeast. To be used in amounts not greater than 25% in flour blends. Make sure it is certified gluten free oat flour. High in fiber, protein and nutrition, oats add taste, texture and structure to cookies, breads and other baked goods. You can make your own oat flour by grinding raw oats in a clean coffee grinder or food processor. To be used in amounts not greater than 30% in flour blends. These are the newest additions to the line-up of gluten-free flours. They have many benefits similar to bean flours but without the strong aftertaste. High protein content lends structure to baked goods without adding any distinct flavor. Green pea flour is not suitable for baking as it imparts a green hue. To be used in amounts not greater than 30% in flour blends as too much of these flours can give off a starchy taste. Potato Starch (not the same as Potato Flour) is made from the starch of dehydrated potatoes. It is a white powder is often used as a one-for-one substitution for cornstarch in recipes. It has excellent baking qualities, particularly when combined with eggs. Contains no protein or fat. Normally ½ to ¾ cup potato starch are added to a gluten free flour mix. Note : Potato starch tends to clump, so it should be stirred for accurate measuring. Potato Flour is made from dehydrated potatoes. It is afine yellow-white powder and is high in fiber and protein. It can be used in place of xanthan gum or guar gum in gluten-free baking. It lends a soft, chewy mouth-feel to baked goods, homemade pasta, breads and pizza crust. Normally only 2 to 4 tablespoons are used in a recipe, as too much will lead to a gummy texture. This flour is easy to digest. Quinoa contains high levels of calcium, protein, complex carbohydrates, phosphorous, iron, fiber and B vitamins. It has a delicate, nutty flavor that’s similar to wild rice. Quinoa flakes are an excellent replacement for oats in cookies, breads, cakes and rolls and a delicious addition to granola. To be used in amounts up to 25% in flour blends. It is increases the nutritional value of baked goods. This flour tastes similar to wheat. Available in red and white varieties, it has a slightly sweet taste and imparts a whole-wheat appearance to baked goods. Sorghum flour is high in protein, imparting all-important structure to gluten-free baked goods. It’s also high in fiber, phosphorous, potassium, B vitamins and protein, and is a great choice for pancakes, breads, muffins and cookies. Sorghum flour is ideal for darker-colored, heavier baked goods, like brown bread or ginger cookies. To be used in amounts not greater than 30 % in a flour mix. Originally from the plant known as Cassava, tapioca starch is made when the root of the plant is boiled, dried, and then ground into a very fine powder. Tapioca flour or starch is typically used as a thickening agent and closely resembles talcum powder in color and texture. The flavor is typically very mild and it adds a delicious, golden crust with a lighter texture to baked goods like breads and muffins. Tapioca flour normally should not be substituted directly for wheat flour, but should be used in conjunction with other flours, however in recipes like Pan de Yuca or Brazillian Bread, it is used on its own. This flour is high in protein, fiber and calcium. It gives a mild, nutty taste to cookies, cakes, quick breads, pancakes and waffles. To be used in amounts no more than 25 % in a flour blend as too much can overpower delicate recipes. The following can all be used in your gluten free baking to mimic gluten’s stretchy behaviour. If no binder is used in GF baking, you can end up with a very crumbly product. Guar gum is very popular in gluten free baking because it increases the chewiness to doughs. Guar gum is made from a part of the guar bean ground up. It is used in the same way like Xantham gum below. It is also much cheaper in cost than Xantham Gum. Psyllium Husk is lately being used in place of Xantham or Guar Gum. Many claim that it adds rise, flexibility and strength to gluten free baking, mimicking gluten’s job in bread baking. When mixed with water and added to the blend of gluten free flours, the dough becomes pliable like gluten bread dough. Psyllium seed husks bind moisture and help make breads less crumbly. It can be kneaded and gives it stretch and elasticity. You may need to add a little more water to your recipe as psyllium coagulates with liquids more than other binders. Ratio to the flour is normally 1 level tsp to 3 cups of gluten free flour. Note : Psyllium Husk might not agree with everybody and might give you some side effects. Xantham gum is used in gluten-free cooking to bind, thicken and emulsify gluten-free ingredients. Too much though, can give the baked product an overly gummy texture apart from an aftertaste. 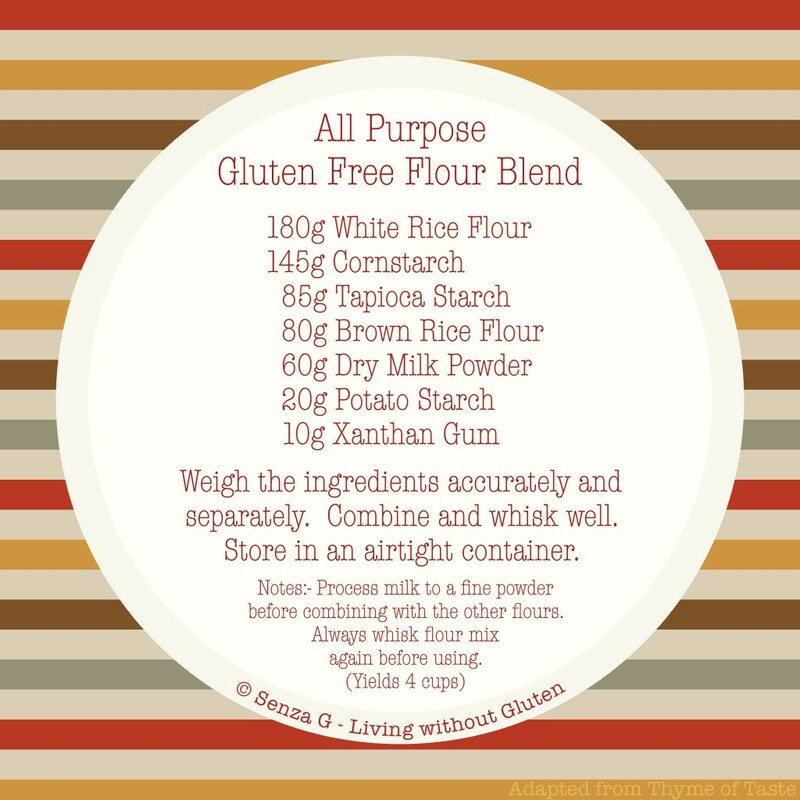 It is therefore important to check the ingredients on a GF All Purpose Flour Blend to see if the mix already has it before adding more Xantham Gum to your recipe. In some recipes, Xantham gum is used as little as possible and sometimes even omitted, as it can also have some side effects or reactions on some people. Hence the reason why it is nowadays being replaced with Psyllium husks, flax seed or chia seeds. Ensure that you use Gluten Free Baking Powder. The reason is that Baking Powder often contains an ingredient that helps absorb moisture so it will not clump and some brands use wheat starch at that ingredient. With gluten free baking, the amount of baking powder should always be increased for example if a non gf recipe calls for 1tsp, then use 1 1/2 tsp. Gluten free baked goods will need all the extra leavener since the gluten-replacer isn’t as elastic as gluten. When should you use baking powder and when should you use Baking Soda? Basically, baking powder is baking soda combined with cream of tartar, an acid. Together these two cause a chemical reaction which releases carbon dioxide, causing bubbling. It is this bubbling that cause baked goods to rise. Baking soda on its own is used when there is another ingredient in the recipe that is an acid, for example, buttermilk, vinegar, brown sugar, molasses, honey, maple syrup, citrus, or chocolate. It needs the acid in these ingredients to start the bubbling, gas-releasing process that raises the baked item. So when there are baked items in a recipe, that do not contain an acidic ingredient, baking soda will therefore not work. This is where baking powder comes in and is used instead. Yeast is used in many recipes but mostly in breads and pizzas. When it comes to gluten free bread making, and also pizza dough too, there is no second rise, no punching down of the dough, and no kneading required in order to ‘work’ the gluten. Therefore gluten free bread and pizza are faster to make and bake. So it is a simple mix and beat, cover and rise and bake away! As easy as that. Gluten free bread can be made without a mixer, just beaten by hand, but personally, I find a stand mixer more efficient in achieving a good result. Because of this, the most commonly used yeast is the Instant Dry Yeast, although you can also use Fresh and Active Dry Yeasts. Below is a brief explanation about these yeasts. This is yeast that is alive and usually is crumbled into the dry ingredients. 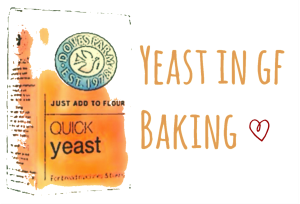 1 cake of yeast is equivalent to 2 1/4 tsp of Active Dry or Instant Yeast. Also known as Quick Rise, Rapid Rise, Fast Rise, Instant Dry and Bread Machine Yeast. This is yeast that is alive but inactive. It does not need to be dissolved in water to become hydrated before mixing, in other words it does not require proofing! This type of yeast can be added directly to the dry ingredients. Active Dry yeast has larger granules and must be dissolved completely for the yeast to become “active,” so it is best to dissolve it in warm water (100° to 110°F) before using. You require more Active Dry yeast than you need Instant Dry. Once you get used to the flours and how and when to use them, you will realise that GF baking is more like science and math … different combination and ratios of flours. Do not be afraid to experiment! As they say … practice makes perfect!